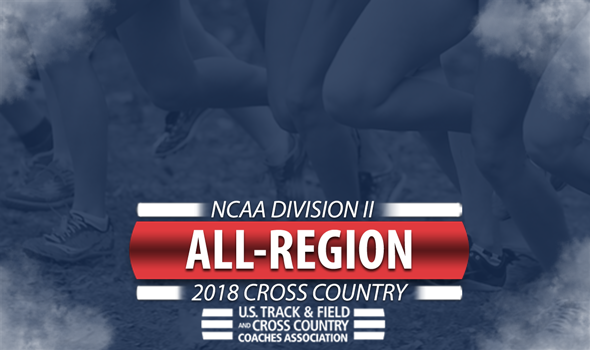 NEW ORLEANS – All-Region honorees for the 2018 NCAA Division II Cross Country season were recognized by the U.S. Track & Field and Cross Country Coaches Association (USTFCCCA) following Regional Championship Weekend on Monday. A total of 200 men from 91 different programs and 200 women from 94 different programs earned the distinction of All-Region by finishing among the top-25 runners at one of the eight regional sites this past weekend. Only four teams in the country had all seven of their athletes earn All-Region honors. The men’s program from Chico State and the women’s programs from Adams State, Stonehill and U-Mary all accomplished the feat with their near-perfect performances at regionals. Quite a few programs nationwide were able to place six runners on the All-Region list. The men’s teams of Augustana (S.D. ), Colorado Mines, Grand Valley State, Queens (N.C.) and Stonehill and the women’s squads of Chico State, Grand Valley State and Western State were all able to do so. Chico State and Stonehill led the nation with a combined 13 All-Region athletes between its men’s and women’s program. Adams State and Grand Valley State were in second with 12 athletes honored. In addition, six men’s programs and four women’s program placed their five scored athletes at regionals on All-Region squads. On a conference level, the Rocky Mountain Athletic Conference led the way with a combined 46 honored athletes. The Pennsylvania State Athletic Conference had 42 honorees while the Northeast-10 Conference had 37, the Gulf South Conference and Great Lakes Intercollegiate Athletic Conference each had 27, while the Northern Sun Intercollegiate Conference and Great Northwest Athletic Conference chipped in 26 each. Many of these All-Region athletes will compete in two weeks at the 2018 NCAA Division II Cross Country Championships on December 1 in Pittsburgh, Pennsylvania.